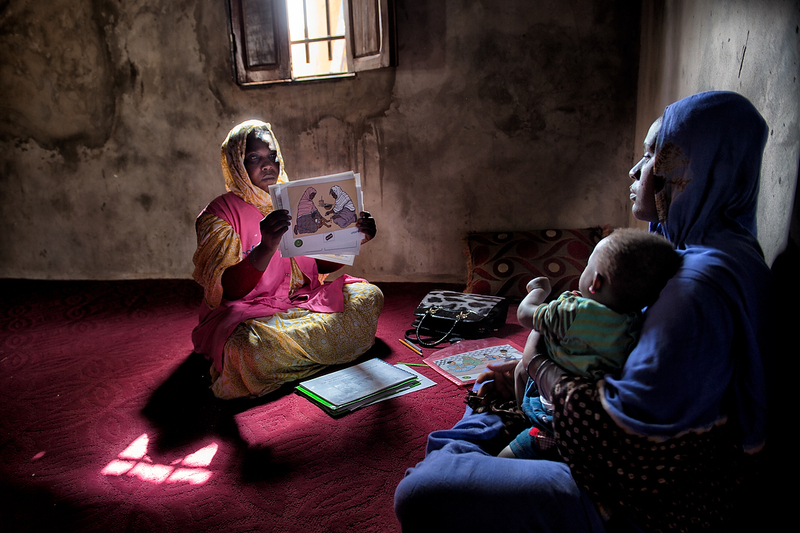 Laila Mint Mohamad Mahmoud and her ten months child Fatimetou, listen to community worker during the nutrition awareness session in Guerrou, Mauritania. Fatimetou’s malnutrition was discovered during the door-to-door awareness and screening sessions four months ago. Community workers referred Fatimetou at CRENI clinic for further treatment. Since then her recovery from malnutrition took positive turn. Her mother, Laila is thankful to the awareness and screening campaign to have discovered on time that her child was malnourished and was treated timely. After that Leila took all her five children to be checked for malnutrition. Ten months Fatimetou is regularly visited by community workers to ensure her complete recovery.